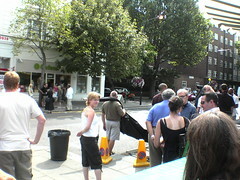 A little bit of Hollywood came to Notting Hill today... and it parked itself right outside my work. In this photo you can see Woody Allen and Scarlett Johannson filming Woody's new movie. Aparently they've been filming around London recently. Click on the picture to see a larger, better notated version. Currently these are only taken with my Camera Phone, so the quality is... average. However as I was meeting my mum and cousin Louise for lunch at Tom's Cafe across the road (behind where this photo is taken) and she'd brought her better digital -- I'll be posting up some great better shots I took. Scarlett is shorter than I thought, and Woody is surprisingly spry for a man his age.